The quilt block was new to me and I had a lot of fun playing around with it. This example uses six different fabrics, but you could easily use less -- you just need to have dark, medium and light values to get the desired effect. 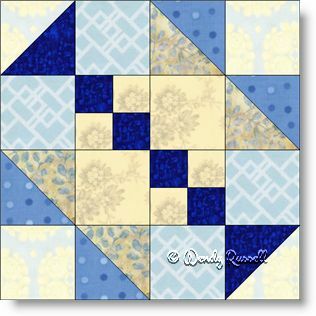 This is a simple four patch block to make, using only squares and half square triangle patches. The sample quilts illustrated use the block on point (with rotation of some of the blocks in the quilt) and blocks set side-by-side -- again with some of the blocks rotated. As you can see you can do lots of interesting variations with regard to placement of this quilt block to make your own precious heirloom.